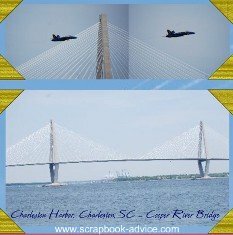 The Blue Angels Scrapbook focuses on Digital Scrapbook pages done from a performance of the group over the Charleston SC Harbor on April 16, 2010. 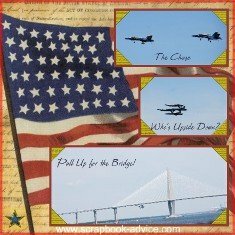 I have a lot of scrapbooks, but my favorites are my military scrapbooks. See a short clip of the U. S. Navy Blue Angels in action along with an interview with Blue Angels Commander Greg McWherter, Class of 1990, The Citadel Military College, Charleston SC. 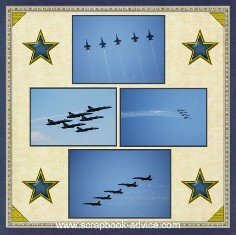 The basis for this first page of the Blue Angels Scrapbook was just one photo enlarged to 12 x 12 inches. This is probably my favorite thing about digital scrapbooking. Using these large photos as the background ensures that my photos will match! Digital Scrapbook Advice Tip: Drag the photo onto the page, under layout, make it 12.5 inches by 12.5 inches. Drag it to fit over the entire layout area. That will allow for an extra 1/4 inch to hang over the edges to ensure full coverage. Then click to make the lowest level - or background level. Digital Scrapbook Advice Tip: Embellishments used were searched on the Heritage Makers System, by typing in Navy and a whole assortment of images popped up for me to choose from. The embellishments I chose were the US Navy Seal in the upper left, the "buttons" with the date and the lettering "Blue Angels" as well as the gold braid for the photo corners. The final embellishment I chose was the clouds. The sky had absolutely no clouds that day, which made for great photos, but I decided to add some to the layout. Very easy to do, just drag the image and drop it in - I also turned them so they would not all look exactly alike. My Heritage Makers System makes it very easy to use the same embellishments on every page without having to search for them each time. 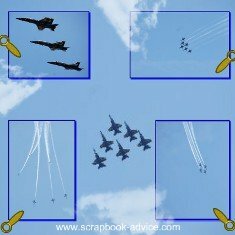 Digital Scrapbook Advice Tip: For these next two Blue Angels Scrapbook Layouts, I used the single large photo for the background of each one - so the blue colors match. The layout on the left has used two photos merged together into the top photo and one photo on the bottom enlarged to 11 inches. This layout also incorporates the gold braid photo corners to hold the photos on. 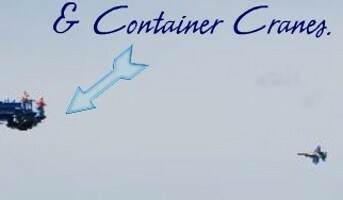 Text was added in a script font in a dark blue. The photos moved on top of the background photo cover the focal point of the aircraft, but the point was to match the color. The layout on the right used the large photo background and has incorporated 4 additional photos with borders added to appear as photo mattes in the same dark blue. More clouds were added, this time layered over both the background and over the added photos. There can be 5 total layers on these Digital Scrapbook Layouts. Photo Turns were used to hold the photos on the right page. Originally they were blue, but I had them recolored to match the gold braid photo corners. 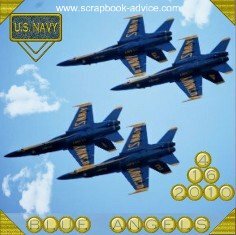 These two Blue Angels Scrapbook Layout use a background paper with the Navy seal as part of the search items that I found when I input Navy in the search box. 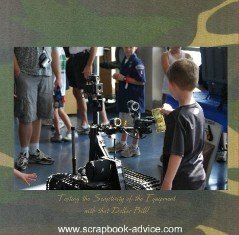 Digital Scrapbook Advice Tip: The Navy Seal was a little dark and the seal did not show up as well as I would have liked, to I used the transparency tool to lighten the paper color. 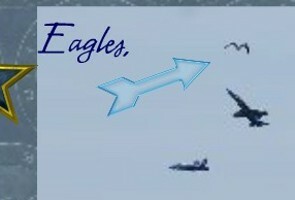 For both layouts, I used cropped and layered photos of various sizes. 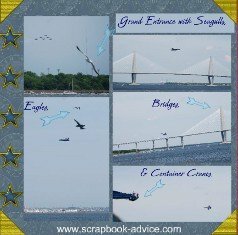 (See Below) The layout on the left has text boxes dropped into the photos and little blue arrows to point to the obstacles that the pilots had to fly around - an Eagle, a Seagull, the Bridge and a Container Crane with workers who had one of those great "Birds Eye Views." 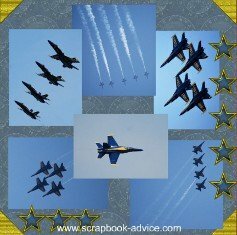 These two Blue Angels Scrapbook Layouts use a background paper from K & Co Kit. 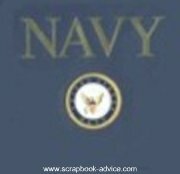 I pulled in three photos for the left page, and added the gold braid photo corners and 2 Stars from the Embellishments on either side of the U S Navy Seal. For the right hand page, I used almost the exact same layout, but included a photo to cover over the seal. I added 4 of the embellishment Stars in each of the 4 corners of unfilled space. 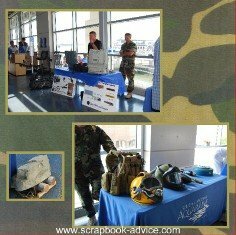 Digital Scrapbook Advice Tip: Text on the left page was colored to match the same blue as the Navy Seal. To do this I highlighted the text and clicked on the color select tool, then on the color on the page that I wanted to match. All of these layouts were put into my U. S. Navy Album by K & Co as shown here. Click on the Album cover to go to our store to purchase. These two Blue Angels Scrapbook Layouts use more of the background papers from the K & Co Kit - two Red, White and Blue papers in a sort of distressed pattern. The left page again has the Gold Braid photo corners just inside the border. The Gold Braid corners are great Navy Scrapbook Ideas. The 4 photos were cropped and then sized exactly the same. The Right page used the Gold Braid photo corners for each photo. The first one was sized and then copied multiple times and dragged into the corners. These last two Blue Angels Scrapbook Layouts show some of the exhibits the Navy put on in the SC Aquarium for the public to view in advance of the Blue Angels performance. The Camoflauge background paper was from the K & Co Kit. The photos were enlarged as there were only 4 for the 2 page layouts and they had a lot of detail. Photos were matted with a color to match the light tan in the camo paper and the journaling was also the same light tan. 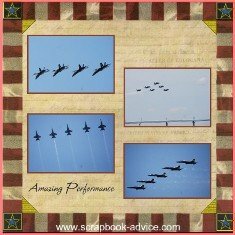 I hope you enjoyed these images of the U S Navy's Blue Angels and I hope you are fortunate enough to get to see one of their fantastic performances and get to do your own Military Scrapbook Layouts. 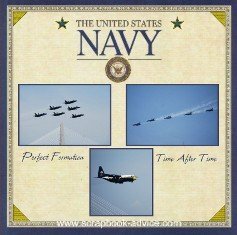 We would love to show some of your Navy Scrapbook Layouts, so please contact us or check out this link so you can post your own. You just might win a gift card if you layout is voted the best of the readers gallery.